Since 1985, aquatechnik® has been at the forefront of manufacturing the highest quality of polypropylene heat fusion welding pipe and fittings for multiple fluid handling systems. 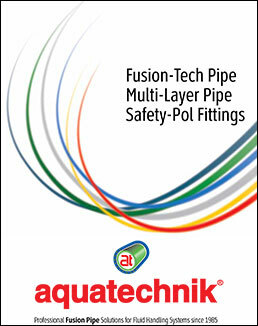 Today, the firm’s manufacturing plant in Magnano, Italy produces a full range of fusion pipe and fitting solutions for export to a growing number of countries world-wide where aquatechnik® fusion pipe is available – now including Canada, the United States and Mexico. The NSF / ANSI 14 certification is an important step forward for the growing aquatechnik North America distribution network, which is now able to market the certified product. In addition, testing is under way for NSF / ANSI 61 covering “drinking water system components;” aquatechnik® certification for that standard is expected in the next month. All major plumbing codes are now requiring that plastic piping products comply with NSF/ANSI Standard 14. The International Plumbing Code, International Residential Code and National Standard Plumbing Code have required compliance with NSF/ANSI Standard 14 for many years, and now the Uniform Plumbing Code also requires NSF/ANSI 14 compliance for plastic pipe and fittings, raising the bar on quality for plastic piping products throughout North America. Celebrating NSF / ANSI 14 certification: Mike Thomas (left) and Steven Thomas (r) of aquatechnik North America with Marco Petenà, managing director and founder of aquatechnik® group sp. About aquatechnik North America: aquatechnik North America is the exclusive distributor of aquatechnik® professional PP-R Fusion Pipe solutions for fluid handling systems. The company distributes aquatechnik® product through authorized regional distributors to their qualified professional installer customers. Visit www.aquatechnikNA.com for more information about aquatechnik&®.